Aaron Spangler lives and works in Park Rapids, Minnesota, near the headwaters of the Mississippi River. An intimacy with this vast northern landscape helps define his practice, as detailed in our recent conversation. 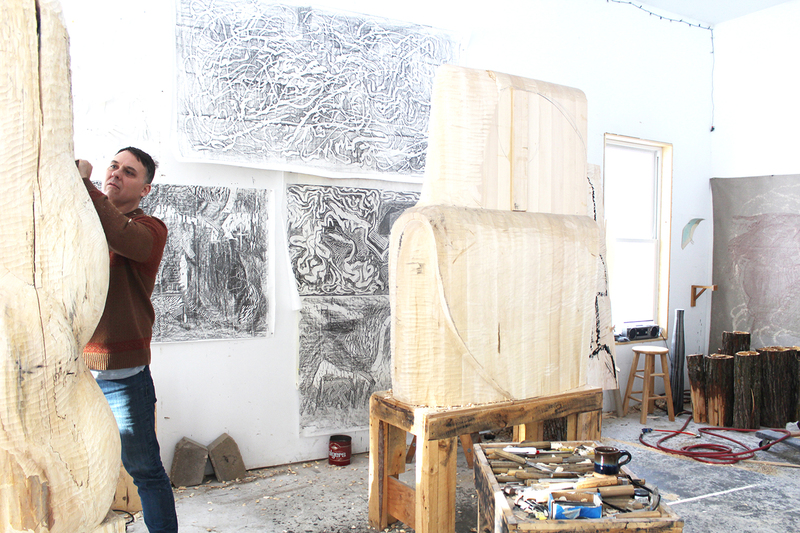 Spangler's work has appeared in recent exhibitions at the Walker Art Center and a new selection of his carved Basswood sculptures will grace the floors of Horton Gallery in an upcoming solo presentation, slated for Fall 2013. 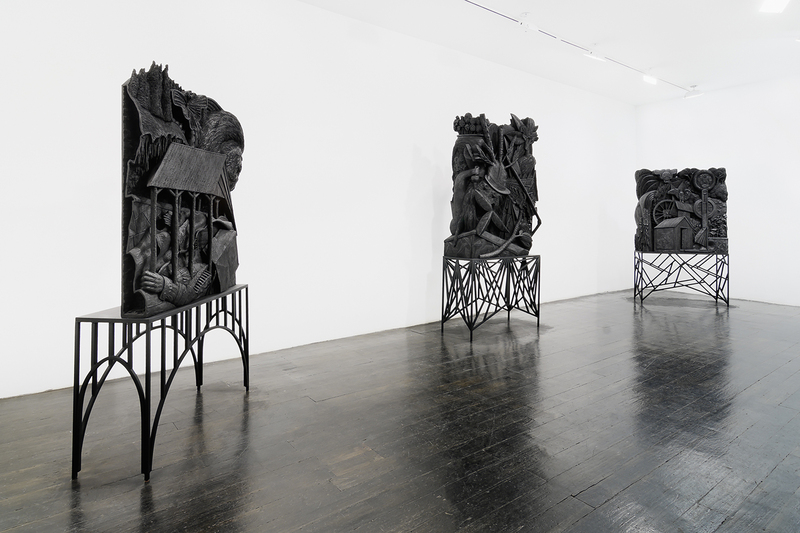 Installation View: Aaron Spangler, "Government Whore," 2010, Horton Gallery, New York. Courtesy of the artist and Horton Gallery, New York. I know that you spent much of your career in New York City. How does now living in rural Northern Minnesota, outside of Park Rapids, affect and shape your practice, vision, or the intentions of your work? Many of the things -- the themes and visuals -- that I'm interested in are here. Having the luxury of taking them for granted liberates me from my compulsions towards them. In New York I felt bound to a memory of what is rural, and here it just is. 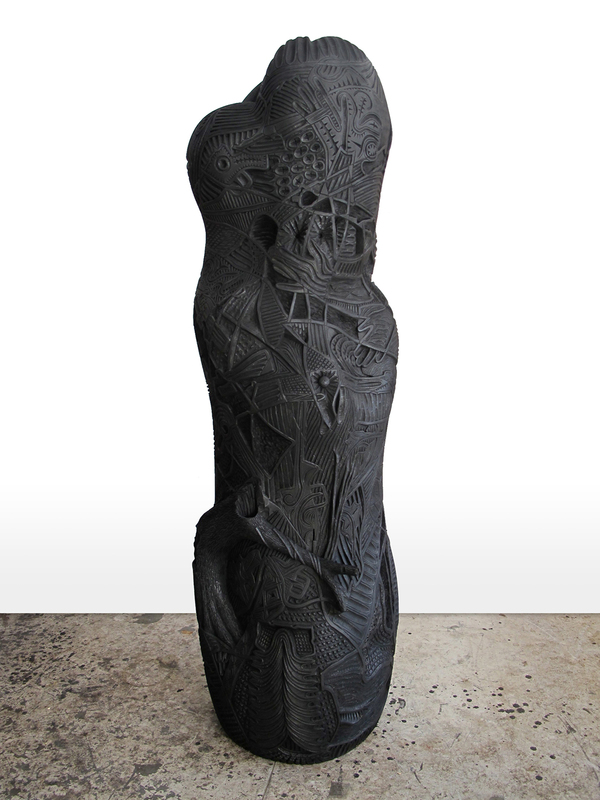 Can you tell us about your transition from working with found object sculptures to wood-carving? I began my interest in sculpture through found materials. The constructions were scrappy and crude. For example, in a sculpture of a building I was working on, I wanted to have carved murals inside of it, so I started carving them with a screwdriver I had sharpened; that's when I became hooked. The line between illusion and real sculptural space fueled my interest in bas-relief and still does. What images or themes inspire your work, and do you intend for the sculptures to crystallize or convey specific or even dominant narratives? Currently I'm witnessing the huge wave of Christian homesteaders sweeping into the rural landscape. I don't think people are aware of the extent of this movement; they're mostly young families with many children, they're into natural foods and healing, gardening and livestock, home birthing and home schooling, all requisite hippie activities -- but with a somewhat "othered" and seclusionary twist. They are everywhere. The other day I was down at the sporting goods store where folks are buying up weaponry as if it were a run on the bank. A young woman with her husband and baby were looking at a pink-handled mini pistol for protection, and I'm thinking, wow, should I be more worried about where I live? Am I naively walking around the woods, or going to the fleet store, the Dairy Queen, etc... unarmed? 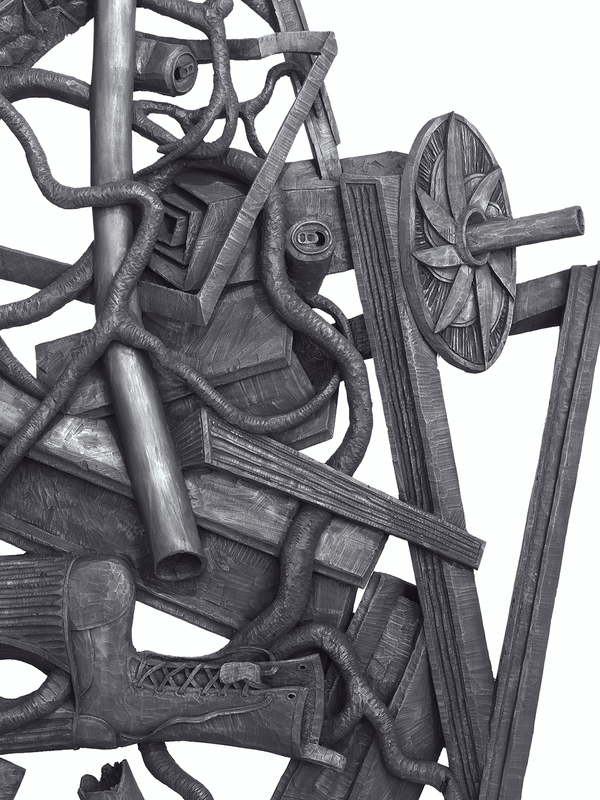 Aaron Spangler, Maple Man, 2009 (Detail), Carved and painted Basswood with a touch of graphite, 83x35x37 in. Courtesy of the artist and Horton Gallery, New York. What has the process been like of independently learning the craftsmanship of carving, and have these techniques evolved in surprising ways? I began carving on a whim and over time it slowly evolved. I've never been concerned with working towards mastery of craft, the evolution of my abilities is motivated by content. What does it mean for you to use age-old mediums like wood-carving in an art landscape that may sometimes be less attuned to ideas of traditional skill and traditional mediums? Is there an overarching desire in your practice to reflect something that carries a different ethos from, say, the idea of more ephemeral conceptual practices, found objects, or digital art, etc.? Well, I think painting and drawing, as well as assemblage are ancient mediums that still thrive. But for the most part I don't associate natural materials with time, they are always around (hopefully) and here for us to use. I think the reason why wood carving remains on the margins of contemporary art is because of its rural associations. Of course this is why I like it and find it useful to the meaning of my work.